Clyde manager Danny Lennon saw his side leapfrog Berwick in the table with last week's win. Clyde will go for five League 2 wins in a row when they welcome bottom side Cowdenbeath to Broadwood on Saturday. Danny Lennon’s side have followed their victories over the top two, Montrose and Peterhead, with further wins over Edinburgh City and Berwick Rangers. The latter came on Saturday courtesy of David Goodwillie’s penalty - the third week in a row the former Scotland striker has come up with a late winner for the Bully Wee. 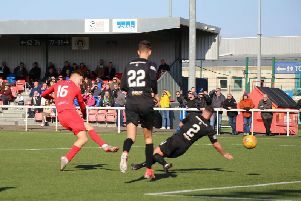 After a lengthy struggle for success, there’s a renewed confidence in the Clyde ranks and the Bully Wee boss feels his side were worthy of the points at Berwick, despite the lateness of the winning goal. He said: “Over the piece I thought we deserved it in terms of the opportunities created. “I did put to the players last week going into the Edinburgh City game that the next three games was like a mini-league between ourselves, Edinburgh, Berwick and Cowdenbeath, all teams that are round about us. “The aim, and what I’ve asked the players to do, is to make sure we finish top of that mini-league come next week. Lennon has added Chris McStay, son of Celtic and Scotland legend Paul, to his squad.